Figure 5.18 (Continued). (B) The three large clots received with the placenta fit the large and 2 other more subtle depressions. The involved areas of placental separation will extend well beyond the actual clot. Figure 5.19. Some retroplacental hemorrhages are not raised above the maternal surface and may not be appreciated until cross-sections are done. 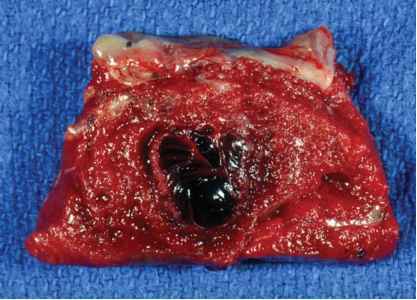 Trapping of maternal blood led to the large retroplacental clot which compressed the villous tissue. The villi above the blood are solid and pale, having infarcted from the lack of maternal blood supply. The clot does not show significant degeneration. Figure 5.20. If delivery does not occur, the villous tissue will continue through the usual stages of infarction and the blood clot will degenerate, as can be seen in this remote retroplacental hemorrhage. Both processes are of roughly similar ages. If one finds fresh blood overlying old infarction, it suggests a previously infracted area separated prematurely. Figure 5.21. In this cross-section of another retroplacental hemorrhage, there is clot on the surface without villous compression. This occurs if blood has a means of egress. 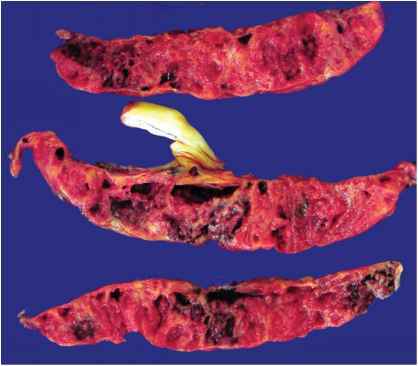 Again there is pallor and infarction of the villous tissue adjacent to the clot. This separation involved nearly the entire placenta and led to fetal demise. 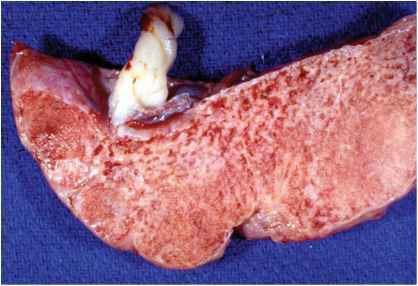 A small old yellow infarct near the fetal surface suggests preexisting vascular disease. Hemorrhage is most commonly seen at the placental margin and many separations start in that region. This fresh hemorrhage undermines the villous tissue and the overlying area is in an early stage of infarction. Marginal hemorrhage is present in this preterm placenta. It extends onto the membranes and not the villous tissue. The brown color of the blood indicates it is breaking down. These hemorrhages come from marginal sinus bleeding and not placental separation. Note the pale attached decidua on the maternal surface. largely maternal, occasionally with some fetal bleeding. Retroplacental hematomas occur both centrally and at the margin of the placenta and overlap villous tissue (Figure 5.22). If placental delivery is delayed or incomplete, one may see fresh retro-placental hemorrhage with slightly adherent blood clot and villous collapse. This, of course, has no implications for the infant. True marginal hemorrhage will also have no fetal effects. It is peripheral, with the aggregate of blood extending onto the membranes, not separating the placenta (Figure 5.23, Figure 5.24). It is a fundamentally different process, related to marginal sinus hemorrhage. Figure 5.24. This large marginal hemorrhage occurred in an immature placenta. The fetal surface is yellow-green from severe chorioamnionitis. 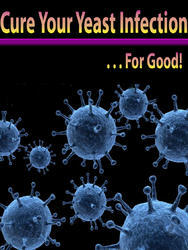 Many severely infected pregnancies deliver prematurely. Such placentas often show substantial hemorrhage at the margin, possibly from necrosis of the infected decidua. This is likely a peripartum event and not the cause of early delivery. The described association of "abruption" with chorioamnionitis is partially due to cases such as this. Intervillous thrombi will be palpable as firm lesions in the placental tissue. They are shinier and more homogenous in texture than infarcts. 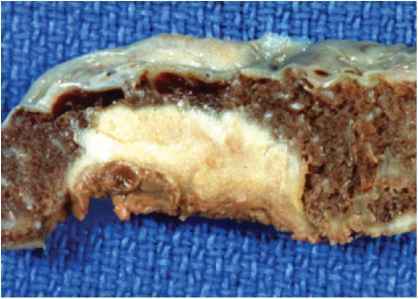 Thrombi are usually located in the midportion of the placenta, as shown here by this fresh lesion with minimal stranding of fibrin. Figure 5.26. These are older thrombi in a fixed placenta. Lines of Zahn can readily be seen. These do not have a marginal rim of infarction. Figure 5.27. This basal intervillous thrombus has several components of different ages. The deep red portion is fresh while the layered material is older. There is a small marginal rim of infarction (arrow). 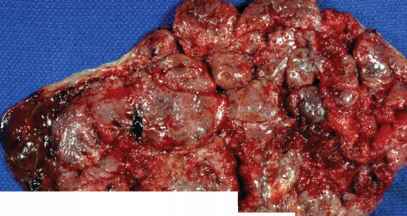 Thrombi occur at the base of the placenta and should not be confused with retroplacental hemorrhage. maternal red blood cells. They are seen more frequently in hydrops and other conditions with large friable placentas.The etiology of these lesions is not clear, but may relate to coagulation at sites of villous damage and fetal bleeding. Infarction may be present as a rim adjacent to intervillous thrombi, which apparently interfere with local villous blood supply. Such associated infarction does not imply maternal vascular disease. Thrombi may also be present at the base of the placenta, where they do not indicate premature placental separation (Figure 5.27). Localized areas of perivillous fibrin deposition are seen in virtually all mature placentas and show an irregular lacelike pattern (Figure 5.28, Figure 5.29). Although the entrapped villi eventually die, small amounts of fibrin deposition are not generally thought to be related to fetal or maternal disease, apparently originating from turbulence in the maternal circulation. Occasionally fibrin deposition is excessive, diffusely involving half or more of the villous tissue (Figure 5.30, Figure 5.31).This degree is abnormal, and associated with preterm delivery, growth retardation, and death. Figure 5.28. This cross section shows a thrombotic lesion (left) and perivillous fibrin deposition (right). The shiny old thrombus is actually an extension of a small, old, subchorionic hemorrhage and not a true intervillous thrombus. 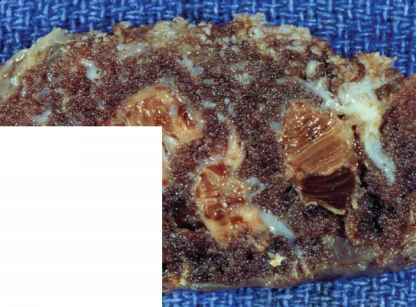 Note the irregular outlines of the fibrin deposition and its admixture with normal villous tissue. There is substantial calcification in this area. Figure 5.29. The white material deposited in this term placenta is fibrin. Such localized fibrin is common in later gestations. It is deposited in the intervillous space around villi in a lacelike fashion, and usually is quite hard and shiny. Although the entrapped villi eventually die, such fibrin deposition is not usually associated with fetal or maternal disease. At times, relatively large regions are involved, as shown here. The process, however, is still localized and not of concern. Figure 5.30. Diffuse fibrin deposition involving more than 50% of the placenta is considered abnormal, and is associated with prematurity, fetal growth retardation, and death. The etiology of such massive perivillous fibrin deposition is unknown. This thick, immature, very pale placenta showing a diffuse network of fibrin was associated with intrauterine demise at 25 weeks of a poorly grown infant. Such placentas are usually quite firm and may actually be relatively heavy. Figure 5.31. 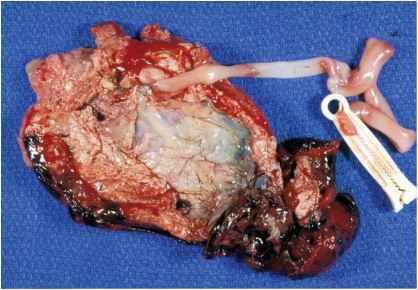 Viewing sections of the entire placenta will help determine the extent of the process, as show in another example of massive perivillous fibrin deposition. The material shows a much coarser pattern, the more typical appearance. "Maternal floor infarction" is a related lesion (Figure 5.32 to Figure 5.34). This is not true infarction, consisting of a layer of bland fibrin deposition around basal villi. It has similar associations to diffuse perivillous fibrin deposition and can be recurrent. The etiology of maternal floor infarction is also unknown. 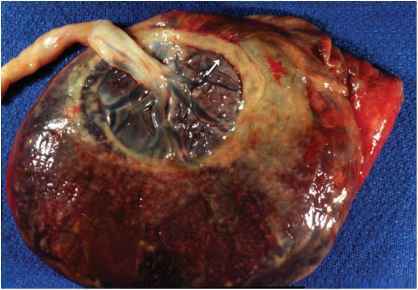 Placentas with excess fibrin, both normal and pathologic, often show surface and septal cysts due to the trophoblastic proliferation which occurs in areas of fibrin. The cysts form within the trophoblastic areas (Figure 4.17, 5.35). Maternal floor of an immature placenta with excess fibrin deposition is shiny and appears stiff showing firm yellow plaques. Such an appearance is suggestive of maternal floor infarction, which is better visualized on cut sections. What causes fibrin deposition on the maternal surface of a placenta?